Posted by Ada Wang on 12/1/2018 2:54:45 PM. If you want to transfer the e-books to other devices or convert e-books to other type, please use the best e-book manager & converter--- Calibre. 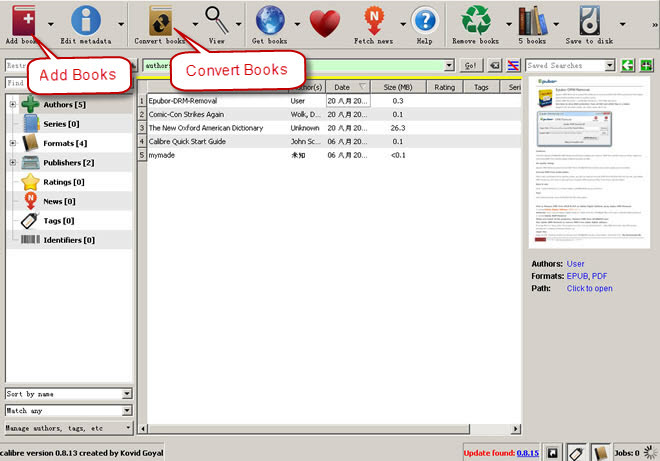 Calibre is a freeware which can convert e-books from format to format. Calibre supports the input formats: CBZ, CBR, CBC, CHM, EPUB, FB2, HTML, LIT, LRF, MOBI, ODT, PDF, PRC, PDB, PML, RB, RTF, SNB, TCR, TXT. The output formats: EPUB, FB2, OEB, LIT, LRF, MOBI, PDB, PML, RB, PDF, SNB, TCR, TXT. 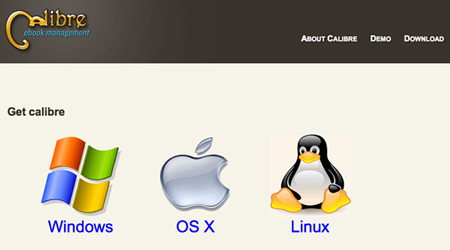 Learn more about Calibre, please view Frequently Asked Questions. After installed the best ebook converter, view it like this. Add your ebooks to library, (when added, the books will list at the top of books list). Select ebook on center menu list, click "convert books" to process converting. 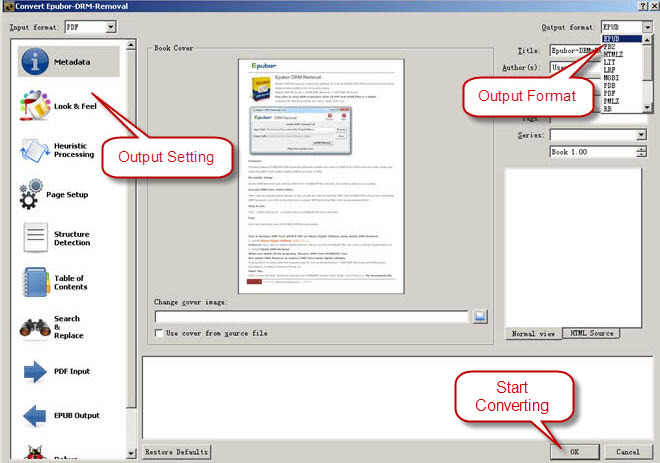 A ebook converting window will pop, choose your Output format and set the output books, it's easy and user-friendly. All set, Click "OK" to start converting. The pop windows will close, and the converter is starting. If not pay more attentions, you can't find any different on main windows, and can't know when the converting process is finished! So, turn your eyes to right bottom, you will see the "Jobs: 1" status. When converting process finished, the status become "Jobs: 0". And you will see "Formats: EPUB, PDF", they are the different types of the books. Want to find the books file? Click "Click to open", you will find them. 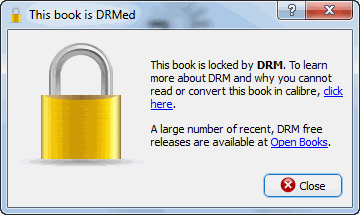 If the following prompt pops during the conversion, it means that book will be DRM protected. In this case, you will have to rely on DRM removal plugins to strip DRM from the books. And then add those drm free books to calibre again to convert formats. Here highly recommend a powerful calibre alternative -- Epubor Ultimate-- all-in-one tool that includes drm removal + formats converter. still one of the worst converters, but highly praised. The results archived mostly differ that much compared to the originals, I always wonder what crap poeple nowadays. If a converter can't keep the textflow on mixed pages (single / multicolumn) which each second best worldprocesser is able to, the best thing to do is to better not mention it, since poeple get disappointed reading books forward beackward each 3 or 4 pages. And Calibre is one of the poorest ones if it comes to this discipline ... still. Hopefully you will find a much better solution. Not able to read PDB file in Calibre nor convert it. Does calibre show anything like "DRM protected" or other info? If that PDB is purchased from eReader, it is likely to be DRM protected, which will have to be DRM stripped before the conversion. hi..... i just downloaded some books from torrent but they will not load into my calibre. i have them on my desktop, drug them over to the kindle, but they don't show up when i start it. how could i convert them? i have an older kindle and can't find many books at my library. What's the format of your downloaded books? Hello I converted files from pdf to mobi but they look weird on my kindle, the line ends in the middle of the screen, the spacing is alright two lines in a row and then there's a huge space beneath them. It's very uncomfortable to read this way, is there any optimal setting which I could use that would make the text appear as if on a page in a regular book? Calibre is an amazing piece of software, it is a powerful conversion tool that allows you complete control over the output of your book. That being said, I understand that some people may have trouble getting started with all the options in the conversion process. I suggest you check out the wealth of "How to's" and "Tips and Tricks" online. Calibre's site has a downloadable manual along with online step by step instructions, another site to check out is the MobileRead Forums. I was overwhelmed myself at first, however, I can assure you that if you put some time into learning the program you will come to appreciate how much it really kicks Arse! Btw, pdf's are really difficult to convert correctly because the are basically an image file. One must remember that Calibre is like a Swiss army knife. It's for this reason that it gets the praise it receives. Yes, it does a great job of converting HTML/CSS to a number of other formats. The sky is the limit when there is some understanding of those two presentation languages. Yet another downside to conversions is that when handling PDF's just about any other software, short of the uber expensive Acrobat, falls short of formatting & converting the Post script. Recent years Adobe has created an even deeper chasm due to the features it has added to the proprietary source code. I have tardive dystonia. I read a good deal. I enjoy boosting a productI use. If you would like me to critique an item or book I would like the distraction. The descriptive ideas presented in your article are shown with such enthusiasm that your passion has taken me over. I'll be forced to research more and try to learn more. Calibre is currently best SW for eBook conversion and management, but it is not for everyone and some advanced knowledge of eBook formats structure is needed. If you can't get expected result than it is not SW for you - you have to dive deep into settings to get better result, and i fixed some pretty messed up PDFs. In most cases bad result means that the source is s***, not that SW is bad. I am also writing to let you be aware of of the extraordinary encounter our child experienced studying your blog. She learned so many pieces, with the inclusion of how it is like to possess a very effective coaching nature to let many others quite simply master a number of tortuous subject matter. You really did more than our own expectations. Thanks for displaying these valuable, trustworthy, revealing as well as easy tips about that topic to Tanya. We are glad you like our website. We will keep working hard to make it better.